Stainless Steel Bar Caddy. The perfect companion for your Firemagic Built-In Bar B Que. This sturdy bar caddy comes equipped with a towel bar, bottle opener, sliding storage drawer, twin stainless steel bottle sleeves and an installation hanger. 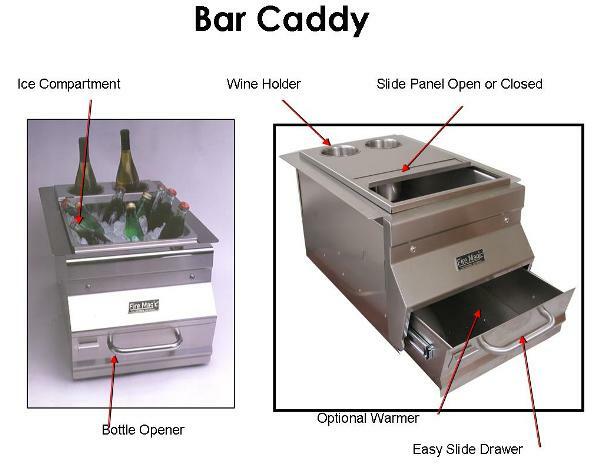 A stainless steel cover tops the bar caddy. Available with the optional steam warming accessory (#3565) and an optional trim kit (3807).